Louis Cornelissen 1861-1883, L. Cornelissen & Son 1884-1977, 1979-present, incorporated as L. Cornelissen & Son Ltd 1980. At 22 Great Queen St, London WC2 by 1861-1987, 105 Great Russell St WC1 from 1988. Lithographic colour maker 1862-1922, artists’ colourman from 1881. 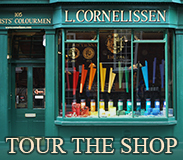 Louis Cornelissen, the founder of the business, is said to have been a Belgian lithographer living in Paris who left following the 1848 revolution, setting up in Drury Lane, initially dealing in lithographic colours and supplies, and reputedly moving to Great Queen St in 1855. Cornelissen was first listed as an artists’ colourman in 1881, and advertised as such from the mid-1880s. Cornelissen provided marked canvases and stretchers for various artists, including Leon Little, John McClure Hamilton and George Clausen. From the 20th century, Rex Whistler for his Tate Britain restaurant wall paintings, and Stephen Bone. Walter R. Sickert was a regular customer. From the pigments found in his studio at his death, it is known that Francis Bacon used Cornelissen’s Rose Madder. The business closed in 1977 at the death of Len Cornelissen, the last in the family, and was reopened in 1979 by Nicholas Walt, subsequently moving from Great Queen St when the lease expired, to shop premises at Great Russell St, where Cornelissen’s continues.